AAC Global Summer School (GSS) is testing a distributed educational model seeking to generate a dynamic network based on distributed knowledge and collective actions. Rooftops are the virgin wild west of contemporary cities. Generally an unexplored, underused whole landscape where to redefine different ways of inhabiting. This year, IAAC Summer School focuses on the study of environmentaly reactive structures. Learning from the flexibility of wood, students from IAAC designed, fabricated and built in a week a sun-reactive light structure on top of the institute. Five arduino-controlled motors through a system of tensors modifies the geometry of the pavilion following in real time the movement of the sun. IAAC GSS 2012 focused on the study of environmentaly reactive structures. HelioCELL is a solar pavilion with the attribute of transforming its structure so as to follow the sun path and get the maximum advantage of the solar radiation, to be captured by the solar panels incorporated on its skin. 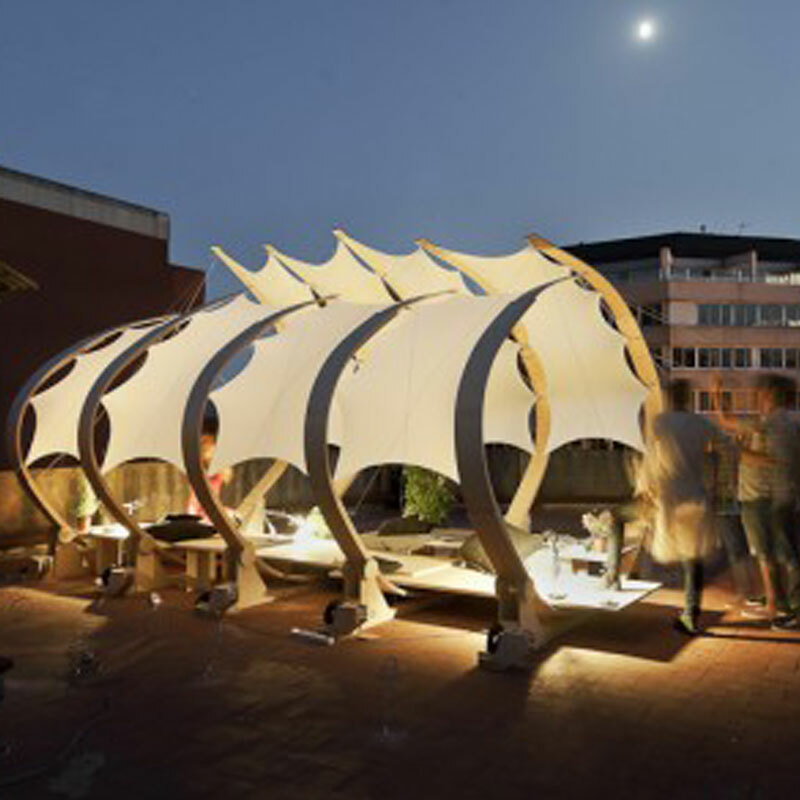 The pavilion is built in bent wood, and the students conducted extensive explorations of bending strategies, by dimensions, fabrication and assembly methods. The structure incorporates sensors and activators, which add a dynamic character to the pavilion, and a controlled movement to the structure’s ribs.